With the emergence of Windows 10 comes new ways to interact with your laptop. You can use Task View to see any open apps you are using. The Snap feature gives you a new way to organize those apps. And the Action Center is useful for accomplishing tasks quickly. Task View allows you to move among open apps easily and create multiple desktops. Click the Task View button to open Task View. 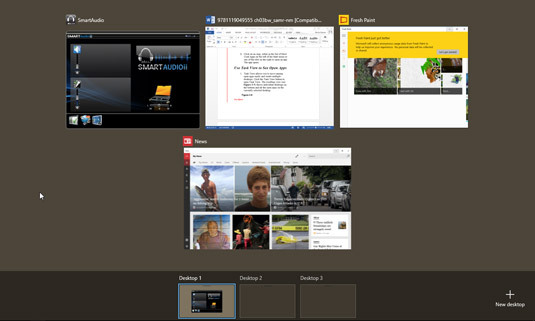 The resulting view shows individual desktops on the bottom and all the open apps on the currently selected desktop. You can also open Task View by pressing Win+Tab. Click any of the apps shown in Task View to work in that app. When you want to switch to another open app, click the Task View button, then click the app that you want to display on the desktop. You can also switch to another open app from the desktop by holding down the Alt key and pressing Tab repeatedly until the desired app is highlighted. Release the keys to work in the highlighted app. 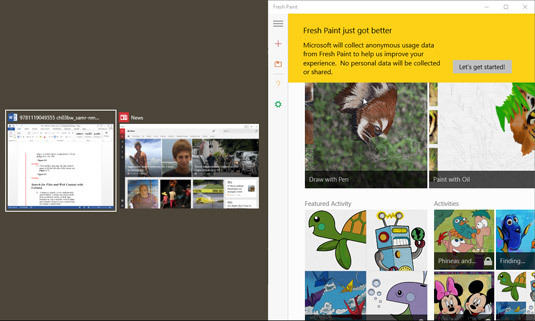 Windows 10 has a feature called Snap used to organize open apps on the desktop. Click on the Task View button and then click on an app you want to work with. 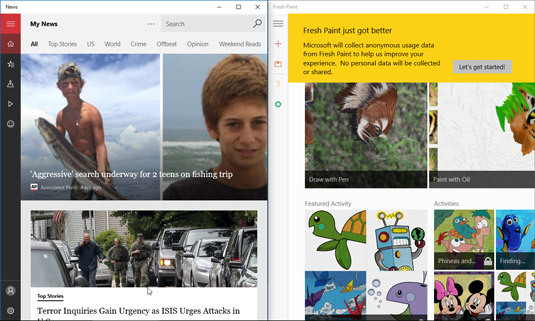 Press Win+→; the app window snaps to the right half of the screen and thumbnail images of any other open apps appear on the left half of the screen. Click another open app; the app window snaps to fill the left side of the screen. The Action Center is new in Windows 10. This pane contains notifications of events, such as appointment reminders and required system updates. On the taskbar, click the Action Center button. In the resulting Action Center pane read any notifications near the top of the pane. Click a Quick Action button such as Tablet Mode, Wi-Fi, Bluetooth, Battery Saver, Location, Rotation Lock, or Airplane Mode to turn a feature on or off. Click Brightness to raise or lower the brightness level. Click a Quick Action button such as All Settings or VPN to work with more settings in that category.